Mallorca, or Majorca as it sometimes spelled, is the largest of the Balearic Islands. Most visitors to Mallorca arrive at Palma airport, Son Sant Joan about 7 miles (11kms) outside the city. 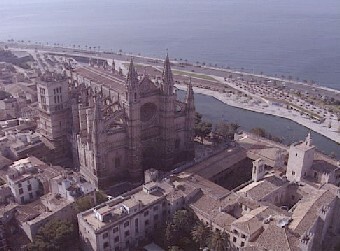 Palma itself is a sophisticated Mediterranean city built around a sheltered bay. As the Berlitz Guide says: "with palm trees and bushes of fragrant oleander, outdoor cafes with colourful awnings, and yachts bobbing in the bay among working vessels." The city is dominated by La Seu, the great Gothic cathedral that took four centuries to build begun in 1230 AD after Mallorca was captured from the Moors. It stands on the site of the Great Mosque. 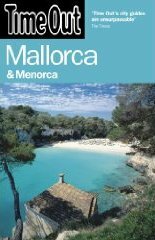 As one of the the Balearic islands, Mallorca is a continuation of a Spanish mountain chain known as the Balearic Cordilleras. Over millions of years, earth movements have pushed these mountains up and down, at times providing a land bridge with the Spanish mountains, at other times - as now - isolating them as islands in the Mediterranean. the Sierra de Levante hills of the south-east. Copyright © 2006-2019 Alan Price and AnythingButWork.com contributors. All rights reserved.